Weeding makes it all worth it. Investing in making the most room for your seeds and baby plants to grow, will lead to a fruitful garden in the upcoming months. Within just a week of planting seeds, little weeds and unintentional veggies and herbs started to sprout in my beds. Somehow, Cilantro seeds have found their way into both of my garden beds, plus some leftover potatoes. It is important that I remove these and the weeds to make room for the veggies I am attempting to grow. You may need to give the weeds a little time to grow to know if it is a weed vs. a vegetable. If you start to observe, you will quickly become familiar with what the beginning stages of your vegetable looks like vs. a young weed or unintentional crop. After spending a few hours (consider it time to de-stress) cleaning up my beds, I saw positive results within just a few days. My young veggies finally had more room to grow and there was room for seeds to continue to sprout. 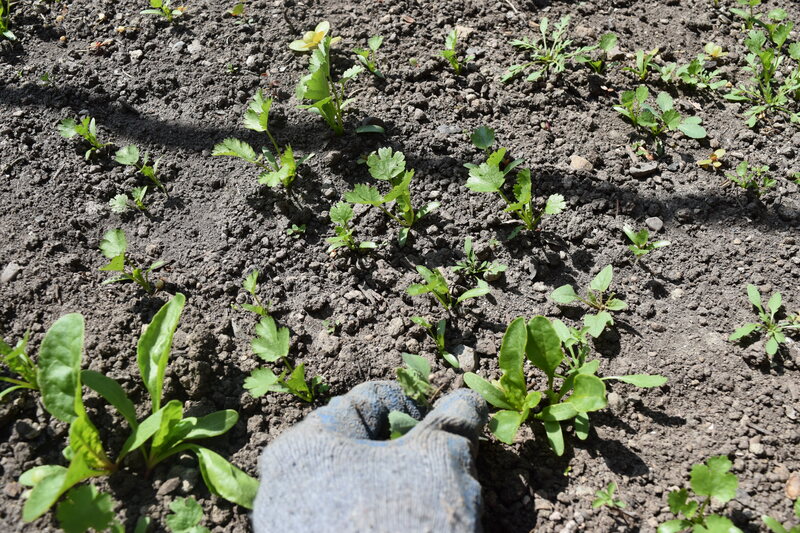 If you can weed a little bit every few days or at least every week, it will start to feel like an easy part of your routine and you will start to see a difference of more vegetable and less weeds. Eventually the veggies will overtake the weeds and you will get to spend more time harvesting than weeding.